Florida is the place where the sun shines all year long. 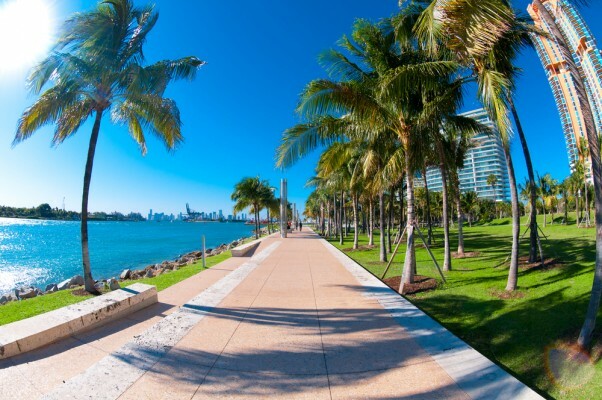 With an abundance of sandy white beaches and great weather, Miami is the place to be. We caught up with beauty bloggers, Carmen (Viva Fashion ) and Maria (The Wordy Girl) to find out how they maintain beautiful, healthy hair under the Miami sun. What is the greatest thing about Miami beaches? Carmen: The best thing I would say is how crystal clear the water is. It really does make you feel like you’re in paradise. It also lends itself to so many activities, my husband and I for example just got into paddle boarding and it’s amazing! 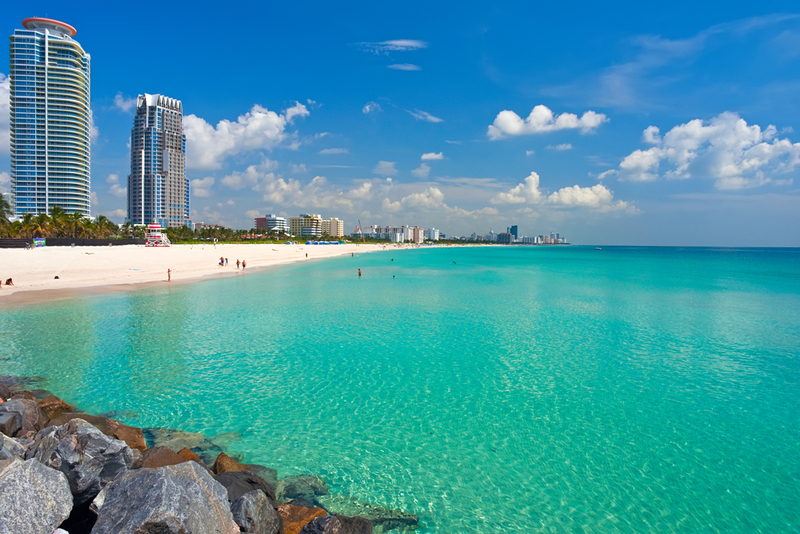 Maria: Florida’s beaches boast stretches of powder white sand and crystal-clear waters. Our beaches are unique because they are pristine and much like the Caribbean — flawless with calm waters. Which are your top three favorite beaches in Miami? Carmen: Well, I live two blocks from the beach, so I’m partial to Surfside (95th and Collins) but I also really like the beach near South Pointe Park and around 3rd Street and Collins. Maria: Every Friday, you can spot me plopped in front of Soho Beach House. When I was younger the area “South of Fifth” was my favorite haunt. When with my kids, we love the beaches of Bal Harbour. Which hair style would you sport at the beach? Carmen: A braid for sure! Lately I’ve been into side French braids and fishtail braids. 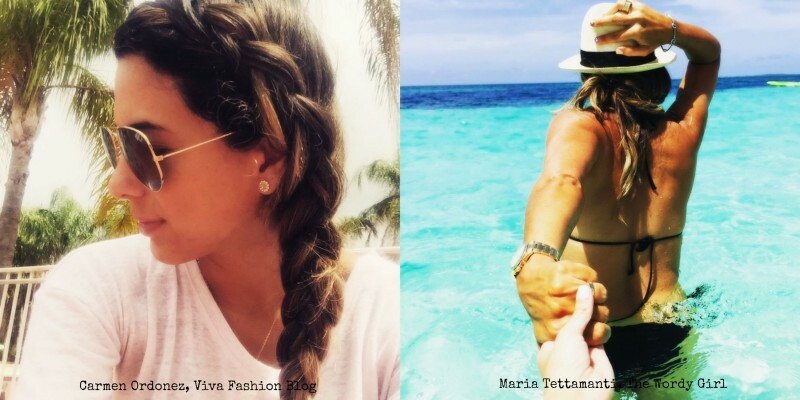 Maria: I always wear a pony tail to the beach — or if I have a fresh blowout, I will wear it clipped up. Somehow, I have mastered the art of not getting my hair wet when cooling off in the water! What do you usually bring for a day at the beach? Carmen: I never leave home without sunglasses, sunblock, a floppy hat and a beach bucket full of toys, of course (for my toddler). Maria: I never leave home without a hat, strong SPF and a colorful cover-up. Water is essential, too, because you’ve got to stay hydrated. Can you tell us a little about your hair beauty regime in summer? Carmen: Since I spend a lot of time at the pool and beach, I try to make sure I’m doing a hair treatment at least once every two weeks. I like to stay away from harsh chemicals as much as I can, so I try to keep it natural with organic coconut oil (which works just as well as a hair conditioning treatment). I’ll sometimes use avocado too! Maria: I always get professional blowouts and sprinkle Baptiste dry shampoo in between washes. What is your best advice for a day at the beach? Carmen: My best advice is to really protect your skin. Many times I forget to reapply sunscreen, but it’s so important! Maria: While the sun and beach are so relaxing, good company is just as important. I love to surround myself with friends or my children — depending on whether or not rosé is involved. How can you protect your hair against sun and water damage? Carmen: My best advice is to wear a hat or use a leave-in conditioner. Maria: I rarely wet my hair at the beach as I wear it up in a clip. I always wear a hat which protects my color, too. Carmen: I actually try NOT to wash my hair every day. Instead, I’ll wash it every other day, so it retains its natural oils. Maria: I actually take Hairfinity supplements, only use high-end goods and get trims every three months. A famous hairdresser once told me that the key to great hair is regular haircuts. Thanks to Carmen and Maria for taking us through their beach routine. Make sure you check out their blogs and follow them on Twitter @VivaFashion, @MariaTettamanti and Instagram. If you have any other beach advice, let us know in the comments! Happy summer!